At Russel Anderson Jr. Dentistry, Dr. Russell Anderson can restore your missing or damaged teeth with dental implants in Kennesaw, GA. Your smile has the potential to be full and complete again! Dental implants are small titanium rods that are inserted into the jawbone. They replace missing tooth roots and give you a foundation for a brand new smile. Dental implants are topped with restorations like crowns, bridges, or dentures that are carefully designed to complement your face. This advanced solution will allow you to chew, speak, and smile again. 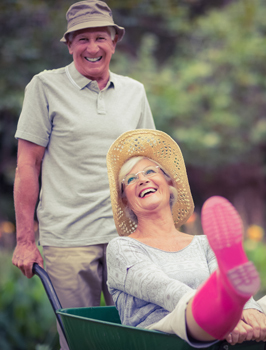 With proper care, dental implants can last for a lifetime! Durability: Dental implants are a long-term solution that are more durable than any other dental restoration. Comfort: Dental implants are designed to feel surprisingly similar to natural teeth. Protection: Dental implants stimulate the bone structure and prevent deterioration. They will also protect your remaining healthy teeth because they don’t rely on them for support. Confidence: Dental implants are remarkably secure, so you can smile, chew, and speak with the utmost confidence. As we design your dental implant restorations, we will ask you what your needs, concerns, and goals are for your smile. Our team strives to cater to your preferences. We will help you attain a breathtaking smile that will only enhance your natural beauty. We have decided to work with a great periodontist just down the road who will place the implants depending on the diagnosis given in our office. Dr. Anderson will place the beautiful crown, denture, or other restoration after the implant has integrated and fused to the jawbone. Your smile will be fully restored and stunning! Dr. Anderson deals with missing teeth every day. He can help you determine if dental implants are right for you. Dr. Anderson is dedicated to giving his patients solutions that will serve them throughout the rest of their lives. At Russel Anderson Jr. Dentistry, our team consistently goes the extra mile to give you unparalleled dental results. We also strive to make our office a warm and welcoming place, so that you always feel comfortable during your appointments. We look forward to working with you. Contact our office to schedule your free consultation today!